LG has launched a new Q series smartphone LG Q8 2018 for the Korean market today that not only comes with the military grade durability with MIL-STD 810G but also comes with IP68-certification that makes it water and dust resistant. It also comes with Portrait mode, QLens, Hi-Fi quality audio, DTS:X 3D Surround Sound, and Hi-Fi Quad DAC. The LG Q8 2018 is priced at 539,000 won (around $470) and will go on sale in Korea soon. It comes with Aurora Black and Moroccan Blue color options. There are no details available when it will be available outside the Korean market. The new LG Q8 2018 features a 6.2-inch 18:9 FHD+ FullVision 389ppi display with a 2160 x 1080 pixels resolution. It is powered by a 1.8GHz Octa-Core Snapdragon 450 14nm Mobile Platform with Adreno 506 GPU and comes with 4GB RAM and 64GB of internal storage capacity that is expandable up to 2TB with the help of a microSD card. It runs on the Android 8.1 (Oreo) OS out of the box and comes with single SIM option. It features a single 16-megapixel rear camera with LED Flash, PDAF and has a 5-megapixel (100-degree Super Wide Angle) front-facing camera. It has a 3,300mAh built-in battery Qualcomm Quick Charge 3.0 with fast charging and connectivity options available are 4G VoLTE, WiFi 802.11 ac, Bluetooth 4.2 LE, GPS / GLONASS, USB Type-C 2.0, 3.5mm audio jack and has additional options such as FM Radio, Hi-Fi audio, DTS:X 3D Surround, Hi-Fi Quad DAC, a fingerprint sensor and built-in stylus. It comes with water and dust resistant feature with IP68 ratings. The LG Q8 2018 is also MIL-STD 810G certified. It measures 160.1 x77.7 x 8.4mm and weighs 172 grams. 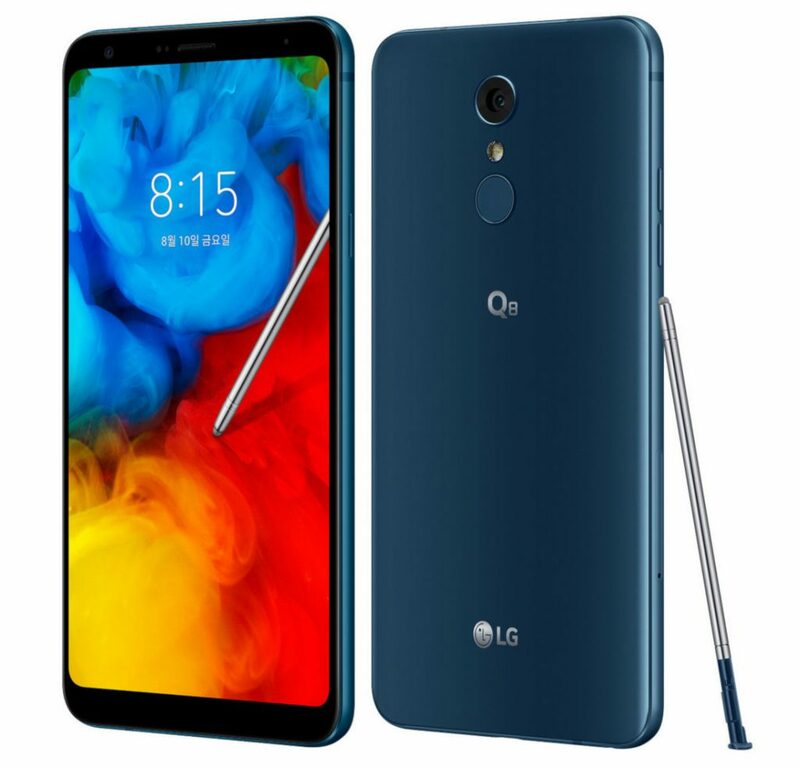 The LG Q7 series that includes LG Q7, LG Q7+, and LG Q7α smartphones were launched in May this year and the company has launched the LG Q8 2018 just after 2 months of its launch. The Q7 series phones were also having a single rear camera and have a 3000mAH battery. All were having 5.5-inches displays but the new Q8 has a bigger 6.2-inches display which is bigger size comparing to the Q7 series. We have to wait for its announcement for the other markets in the future.